After college, my friend, Danielle and I got a row house in South Philly, just east of Pat’s and Geno’s. (Yes, Geno’s is my favorite, though I only ate one cheesesteak during the two years I lived there. There’s something about walking to work each morning at 6am with the undeniable stench of greasy meat and fried onions that kind of turns you off. But don’t worry there were plenty before and have been more since). Danielle and I lived together in college with some other friend and did a bit of cooking. Generally this was to the extent of making some boxed mac and cheese or a salad. We occasionally had “fancy” meals, a weekly mandatory family dinner night, but for the most part our eating habits were sporadic and supplemented by takeout. After college things were different. We wanted to cook good food, but with both of us working long days, time was always lacking. I had a crockpot growing up. It was on the smaller side with a red brick print enveloping its inner stoneware. My mom used it occasionally, but it was more of a novelty than a real appliance. I honestly can’t remember where Danielle and I got our crockpot from. Maybe we bought it during a Target shopping spree, or maybe someone gifted it to us. All I know is that one day it wasn’t there and the next it was. And it changed our lives. Danielle was familiar with how to tame a crockpot, so I immediately surrendered to her expertise. 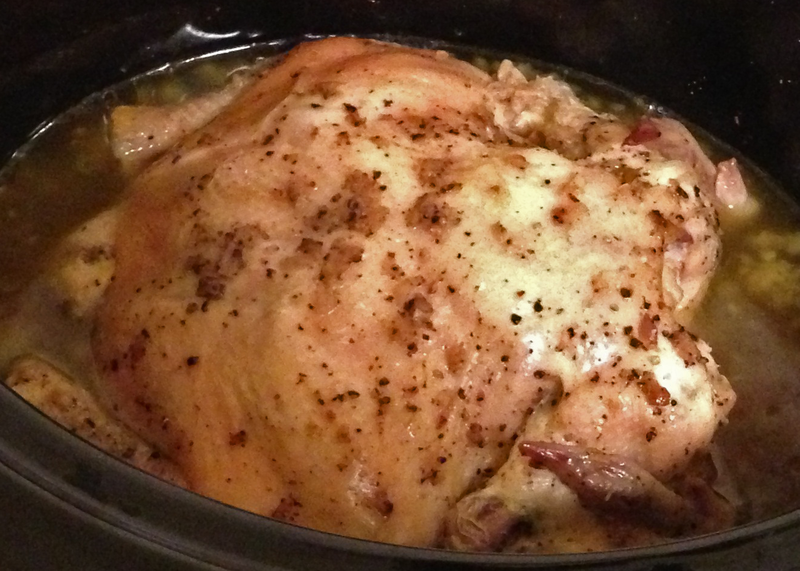 The first recipe I remember making was Crockpot Chicken. I watched. She tossed the raw chicken into the crockpot, poured a little water to cover the bottom, added her customary heaping spoonful of minced garlic, sprinkled some salt and closed it. She set it to low, put her coat on and started heading to work. “That’s it?” I wondered skeptically. But that was it. We came home, whipped up some mashed potatoes, steamed some green beans and sat down to the juiciest chicken I’ve ever tasted. Not only was that chicken the easiest recipe I made (even including my refinements over the years), but it gave me faith in crockpots. Since then I’ve made dozens of different crockpot recipes, and will certainly lean on it if I have some ingredients I’m not sure what to do with. 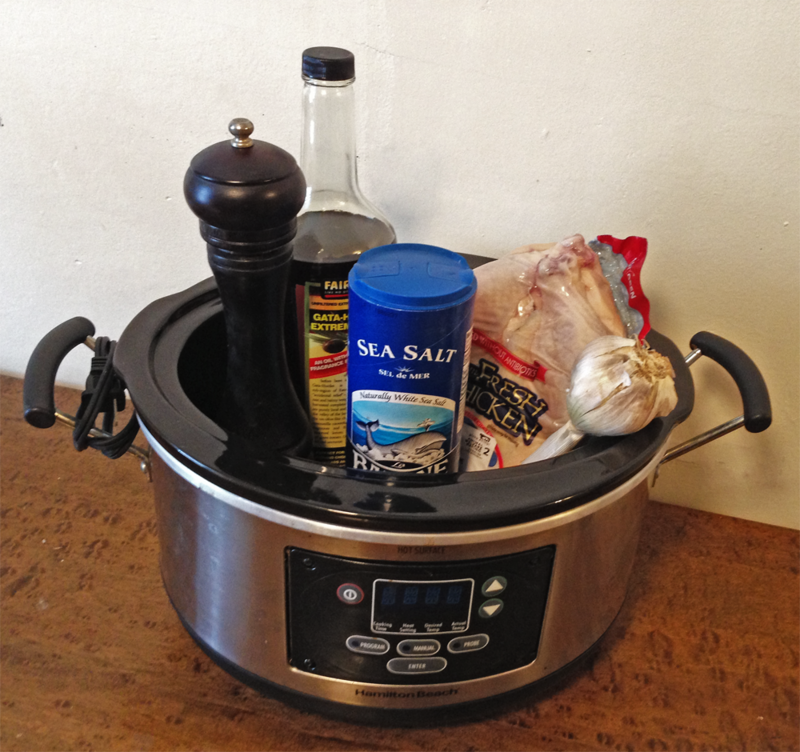 “Just toss it in the crockpot!” But that one recipe I go back to time and time again. Given, it’s not the prettiest dish. It’s something you serve a hungry family, not dinner party guests. The meat is literally falling off the bone so you serve it right from the crock. Any attempt to get the full bird on a serving platter has resulted in complete and utter failure. And admittedly you aren’t going to get that brown crisp skin you would if roasted, but delicious doesn’t need to be beautiful. Crockpot chicken used to be a monthly staple, from my days in Philly, though my life and marriage in Brooklyn. But for some reason, a few years ago I stopped making it. There was no reason, I just forgot. And then a few weeks ago, while at the Park Slope Food Coop, frantically trying to come up with a menu for the week, I found myself starting at a case of whole chickens and thought why not? During the meal, my husband got up for more (I think his third helping?) and commented on its excellence. “How come you never make this anymore?” And I just looked at him. I have no idea. Rinse your chicken with cold water, remove any giblets and pat dry. 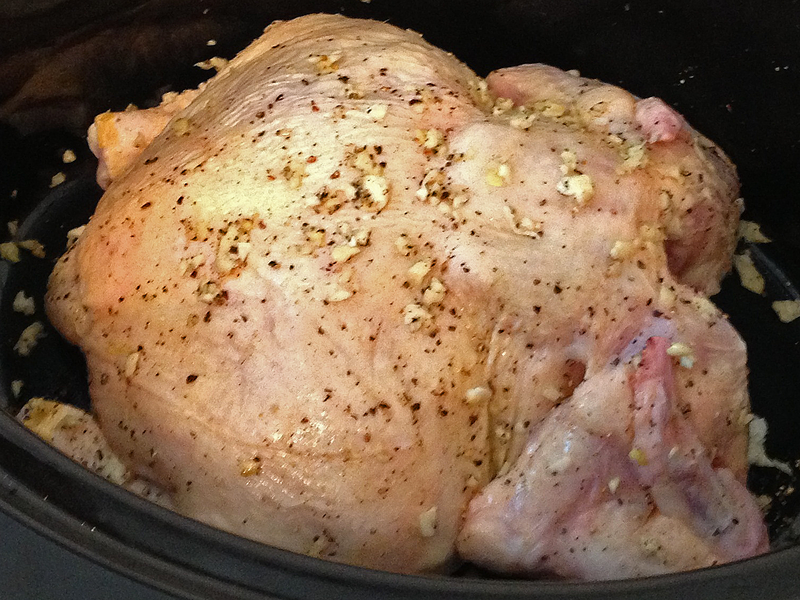 Stick 4 sliced garlic cloves in the cavity and stick it in the crockpot. (I think I cook it breast side down, though I never knew the difference). Drizzle chicken with olive and sprinkle with minced garlic, salt and pepper. Rub ingredients into the skin well. You want the flavor to sink into the skin, not just have puddles of oil. Add a bit of water to just cover the bottom of your pot (I used 1/2 cup). Set crockpot on low for 8-10 hours. The more time the better. Serve with comforting vegetables. NOTE: The leftover chicken also doubles as some awesome chicken salad. Break apart bits of chicken with your fingers, and stir in some salt, pepper, mayo and anything else you have on hand. 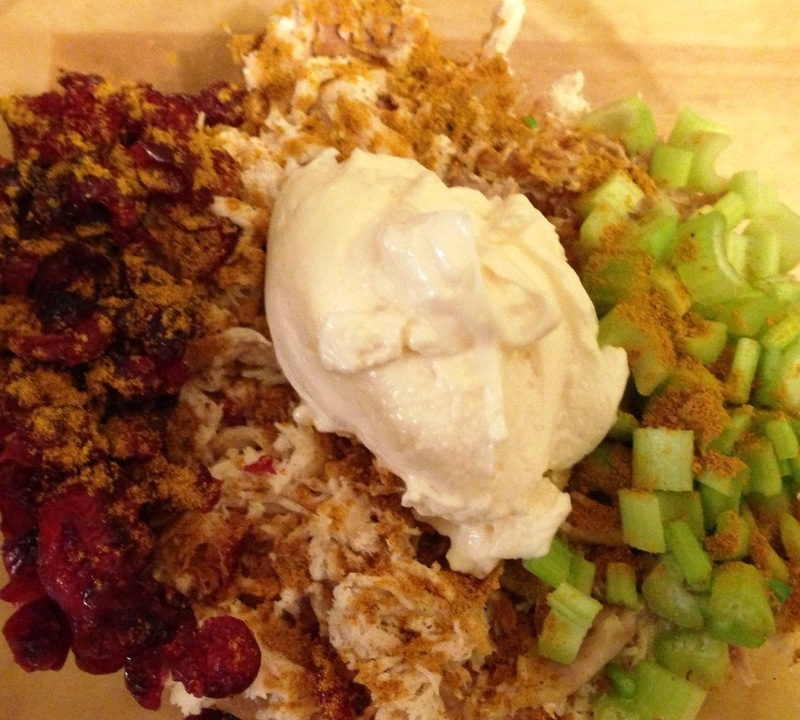 I added some celery, dried cranberries and a little curry powder. Hmm, Pat’s. I don’t know if I like people like you reading my blog… Just kidding! Honestly, I think I just got used to Genos because the line was usually (a bit) shorter. This is true! Genos line always appears to be shorter. Yay! Glad I could help. We’re an Italian seasoning rather than herb de provence kind of household, but same idea. I’ve done that too, and it’s tasty. 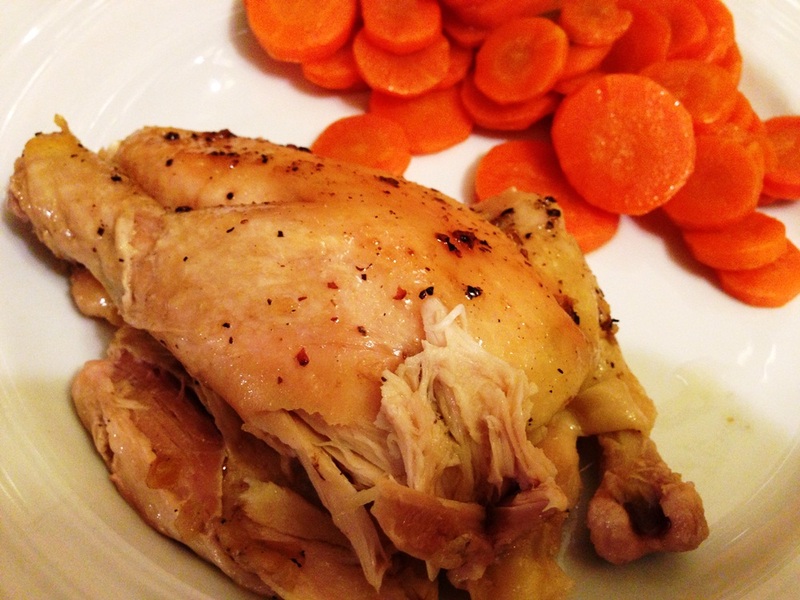 And if I’m feeling really fancy (or lazy, you decide) I’ll sometimes throw in chopped carrots and potatoes to cook with the chicken as a side. You’re very welcome. Your tikka masala recipe is pretty high on my list to make. I’ve tried making tikka masala twice with horrible failures. Third time’s the charm, right?